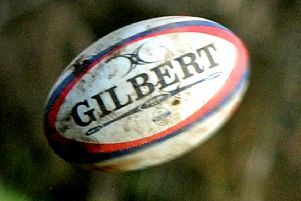 Despite being ahead for most of the match Biggleswade finally went down to Midlands 3 East (South) leaders St Ives by 23-33. After the cup match against Bedford Athletic, Biggleswade had to make several changes with Matt Hill (Reading) and Michael Kendall (Stamford) returning to their current clubs. Jacob Grabowski and Aaron Pickering came back into the squad after being unavailable last week. Last season after losing narrowly at home Biggleswade upset the form book by comprehensively defeating St Ives in the away tie. It looked that a similar result was on the cards as Biggleswade started very strongly. Biggleswade paled with the gusting wind at their backs and towards the lower end of the pitch. Kicking off they took an early lead with the first of three successful penalties from fly-half Like Haverly. He was an important player in Biggleswade’s first try with a well-weighted kick towards the try line. Winger Alex Borg racing up at speed was first to touch the ball down just ahead of the covering defender. St Ives,urged on by their loyal crowd, soon had their first points on the board. Biggy tackled hard but were overwhelmed by a relentless barrage of blue shirts and the try under the posts was inevitable. After one optimistic attempt from over 40 metres out Luke Haverly increased Biggleswade’s lead with another successful penalty. He also added the conversion of a try from flanker Gareth Rutt who used his speed to burst through the defensive line. In the last move of the first half St Ives reduced the deficit with another converted try. All Biggleswade had to do was get the ball off the park but when under pressure this is a whole lot more difficult to do. At the start of the second period Biggy stretched their lead with another penalty. The scrums were solid but the gusting wind upset the best of throws at the lineouts. Biggleswade’s tackle count was high but St Ives had some bug runners who required two or more players to bring down. I was not until the last quarter that St Ives finally snatched victory. A piece of brilliant individual play from the St Ives number ten led to one try. The other came from a charge down close to Biggleswade’s try line. In the post-match huddle skipper Dom Nott expressed the feelings of all when he said that Biggleswade had been in with a shout until the wind advantage finally took its toll. Biggleswade play their last home game on Saturday when they entertain Stockwood Park. On a freezing afternoon in late December they just squeezed home winning 12-10. Then the final match is an away trip to Leicester to take on Vipers.